Created on 27.08.2017 by the user frantsch. 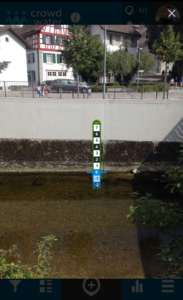 For the water level, users are asked to compare the current water level to a picture of the stream that has a staff gauge (that has been digitally superimposed) with water level categories. The picture below shows an example of such a “digitally superimposed” staff gauge. The staff gauge is added to a picture of the stream and covers the typical range between low and high flow. 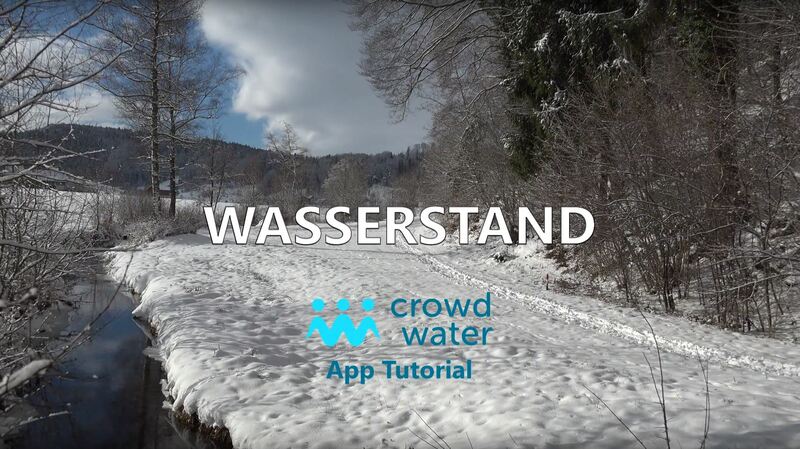 This video explains the method for the water level measurement. Additionally we have a document explaining the placement of the staff gauge. Streamflow is more difficult to assess than the water level. Participants are asked to measure several of the individual components that are needed to calculate streamflow: width of the river (at a particular cross section), mean depth of the water in the river (at the same cross section), flow velocity and the material of the river bed. The flow velocity can be measured by the so called Pooh-stick method. 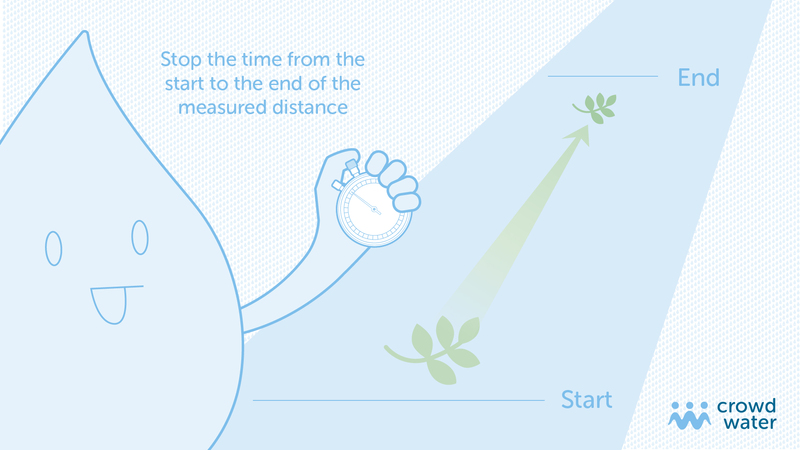 With this method, a stick or a leaf is thrown into the stream and the time required for the stick to flow downstream to a pre-selected distance is measured. This will provide a velocity in m/s, which is the standard unit for flow velocity. For a video about the Pooh-stick method, which is named after Winnie the Pooh, click here. For those in a hurry: the part of the video explaining the game starts at 3:13. The river bed material can be used to estimate the channel roughness and thereby the amout of friction. For courser material, the channel roughness and fricition will be higher, and the river will have a lower velocity. For this the average size of the material on the river bed is needed (sand, gravel, cobbles, boulders, bedrock), not the suspended material that is floating in the river or stream. See below for a graph showing the components stream width, average depth and stream bed material. 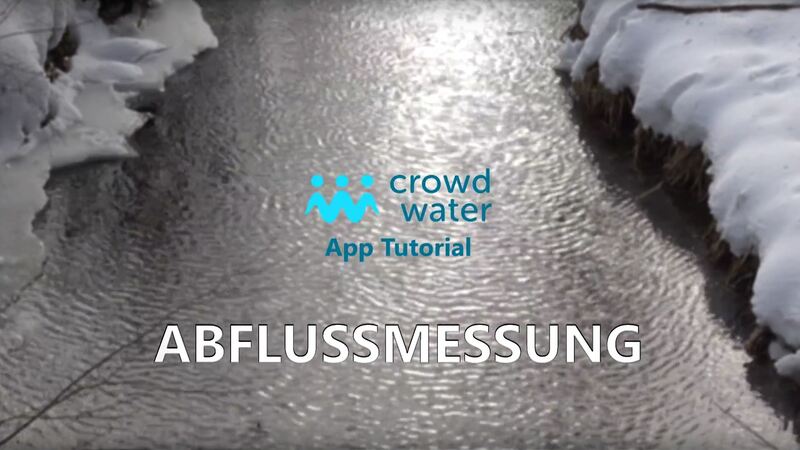 This video explains the method for the streamflow measurement. For soil moisture, a qualitative and easy to use scale has been developed (Rinderer et al., 2012). The participant can chose between seven classes of soil wetness, varying between “so dry, I don’t even get wet when I sit on the ground for a long time” and “so wet, there is water on the surface”. The eight class “rain / snow” is for conditions when the soil moisture cannot be estimated. The eight categories are depicted below. To assess the flow conditions of temporary streams (streams that don’t always have water), a qualitative scale has been developed. The participants can chose between six classes, varying between “dry streambed” and “flowing“. The observations should be based on at least 3 meters of stream length (or roughly 5-10 times the stream width). Bergeron, T., 1960. Operation and results of “‘Project Pluvius.’” In Physics of Precipitation, Geophys. Monogr., No. 5. Amer. Geophys. Union, pp. 152–157. Bergeron, T., 1949. The problem of artificial control of rainfall on the globe. Part II: The coastal orographic maxima of precipitation in autumn and winter. Tellus, 1, pp.15–32. Johnson, M.F. et al., 2014. Network environmentalism: Citizen scientists as agents for environmental advocacy. Global Environmental Change, 29, pp.235–245. Available at: http://linkinghub.elsevier.com/retrieve/pii/S0959378014001733. Rinderer, M. et al., 2012. Sensing with boots and trousers – qualitative field observations of shallow soil moisture patterns. Hydrological Processes, 26(26), pp.4112–4120. Available at: http://doi.wiley.com/10.1002/hyp.9531. van Meerveld, I. et al., 2017. Information content of stream level class data for hydrological model calibration. Hydrologyand Earth System Sciences. Available at: https://doi.org/10.5194/hess-2017-72.